I have a confession to make. 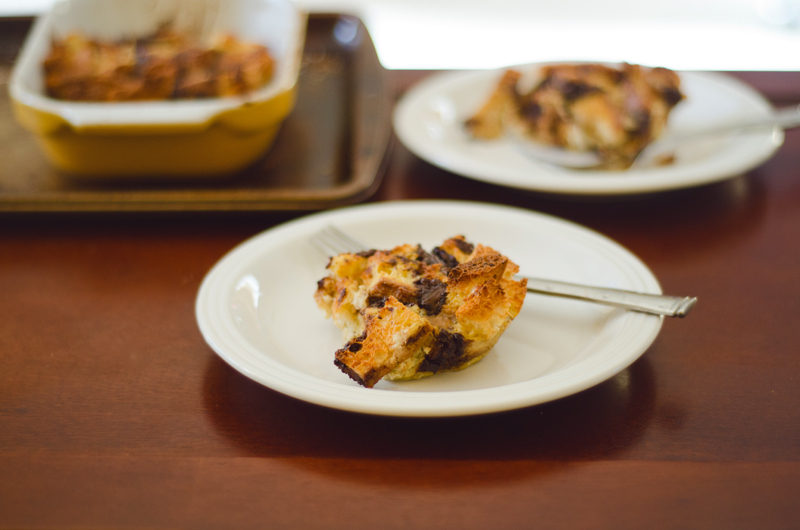 I have never eaten bread pudding before making this one. 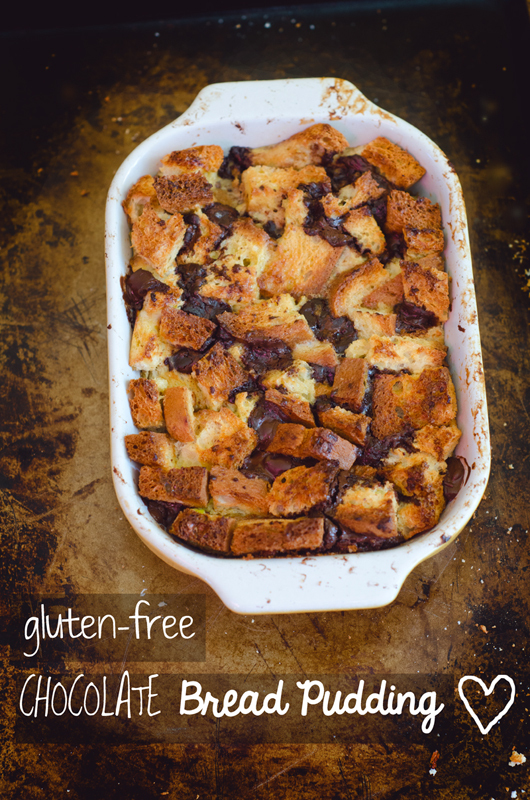 All of those years of gluten eating, and bread pudding never made it on my radar. It wasn’t until my husband ordered something called ” Chocolate Croissant Bread Pudding” at our local bakery that my ears perked up. It sounded amazing. I watched him eat it with a sense of gluten eaters envy. That doesn’t happen too often anymore, since I am SO used to being gluten-free… but there he was eating this melty pot of flakey chocolate and butter and there I was eating yogurt. It was a moment. I felt an injustice and it had to be righted. I have no basis for how a bread pudding tastes. I didn’t really know what went in it. I assumed. I didn’t even do a google search. This could have gone poorly. I will admit that I have a tendency to fly by the seat of my pants in the kitchen. A dash of this and a dash of that. I am not great a measuring things. I keep on having to remind myself to write things down now that I am blogging and sharing things with you lovelies! That’s just how I learned to cook. I call it the “Put Some” method. Every time my Grammie or my Mom would give me a recipe and I would ask them “Wait…how much garlic?” or “How much shoyu?” they would always tell me “Oh, you know…just put some!” So there it is. My general philosophy in the kitchen. Just put some. Cooking by feeling it out. This recipe will make enough for two. Or, maybe four. It depends on how hungry of a hippo you are. I tend to be a hungry hungry hippo in the morning. Chop your UDI’s into cubes and lay them out flat on a baking sheet. When your oven had heated up, put your tray of bread cubes in the oven and lightly toast them. It won’t take long. Check on them after two minutes. If they are not toasting evenly give them a stir with a spatula and let them continue toasting a little longer. Once your bread is toasted, remove it from the oven and set aside. Crack your eggs in a small mixing bowl and whisk them together well. Add in your almond milk, cinnamon and vanilla extract. Whisk until all ingredients are combined thoroughly. Grease your 9 by 5.7 inch pan with butter. Place your toasted bread cubes in your 9 by 5.7 inch pan. Pour your egg and milk mixture over the top. With your clean hands mix the bread and the egg mixture together so that all of the pieces are coated. This is a good time to assess if you have enough liquid. If the mixture looks too dry add a tad bit more almond milk and then mix it again. I would only add almond milk in very small increments. Gluten-free bread isn’t as forgiving as regular bread and does better with a little less liquid. Add in your chocolate chips and mix it up again. Just before baking, take a tbs of butter, cut it into a few little cubes and place them evenly on top of your bread and egg mixture. Pop it in the oven for 25 to 30 minutes. It is done when the egg mixture is no longer runny and it has a beautiful golden brown crust on top. Congratulations! 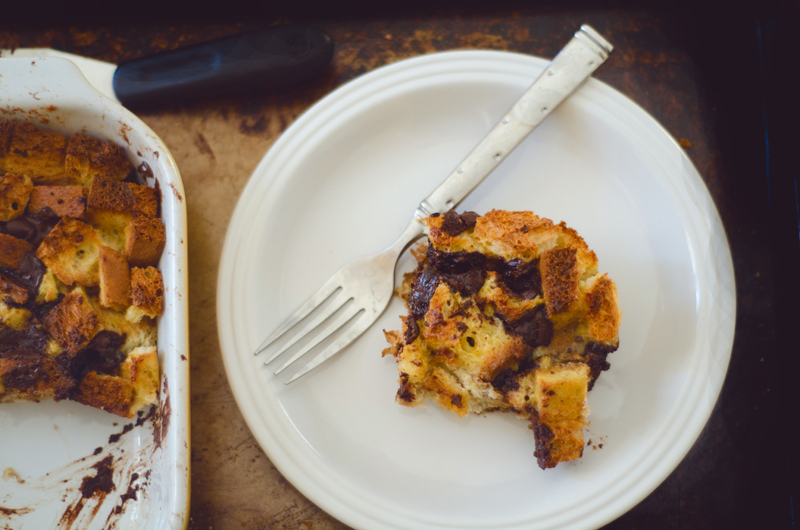 There is no longer a bread pudding injustice. Take that, yogurt. holy moly, this looks amazing! I’m curious what your husband thought of it? It looks super delicious!